Beds: 3 Simple Bed. 1 Double Bed. Equipment: Audio Equipment. Television. DVD Player. Microwave. Coffee Maker. Building amenities: Solarium. Swimming Pool. Barbecue. Patio. Colonial Style. This colonial house is located only 2 blocks from Plaza Dorrego. Inside, one finds a nice mix of antique and modern furniture. The living room looks out into the patio. The dining room has a table that can seat 10, complete sets of silverware and tablecloths. The kitchen is connected to the dining room. Beneath the ground floor, one finds a lovely wine cellar. There are 2 bedrooms. The master bedroom has a king-size bed, a complete bathroom, and a huge window that looks out onto the garden and pool. On the living room, a single bed. The second bedroom has a queen bed and connects to a bathroom with a shower. If you want authentic atmosphere rather than an antiseptic hotel, then this is what we offer. The apartment is ideally suited to tour San Telmo and Buenos Aires. The rustic décor was very interesting. The courtyard and pool are very inviting. Check in was on time and painless. Checking out late was handled very well. Mercedes was readily available for all our questions. There is an awesome empanada/bakery around the corner. The apartment was excellent , old charm always gets me. The location was great and Mercedes and Santiago our host very helpful and gracious. We only stayed a night but all worth it. Would stay here again if ever I go back to visit. Ya son varias las veces que nos alojamos en Casa San Telmo y siempre es genial. Vamos a seguir eligiéndolos! Beautiful place with lots of character, in the heart of San Telmo. Everything as described. Don\'t look anywhere el se - this place is amazing! Highly recommended. Mercedes and her staff are great hosts that we really recommand to everyone. They are reactive for everything we need. For instance , they have book taxis for us, suggested places to go for tango, etc... The appartment is really well located in San Telmo. It is close to public transportation but you can also walk from there to many areas of the city center, if you like it as we do. We recommand Mercedes appartment and hosting, Thank you again! We spent a very nice time in this house. staff was very kind and helpfull. We had some problems in the toilets, but everything was fixed as soon as possible. We surely come again. Location, location. location...it could not be better! In the very heart of San Telmo, yet quiet and secluded is this little oasis or refinement and luxury. Wouldn\'t want to be anywhere else on my next trip. Highly recommended! Was a great time. Area was safe and fun tot walk around in. Apartment was pretty. Fantastic experience. Mercedes was very helpful and welcoming and we enjoyed the apartment very much. The location is excellent if you want to be in San Telmo which we loved. Internet service was good as well. Very good experience. The apartment and garden were simply divine. So full of character. splendid host! Thank you!! Apartment has an individual, inimitable style is a real jewel in the lovely neighborhood of San Telmo. It's a very quiet, peaceful and relaxing place, ideal for a short siesta after a hot Buenos Aires day. We would highly recommend this place, Owner and the staff were always a great help. Plenty of nice cafés, bars and the beautiful Plaza Dorrego are just around the corner. Perfect! La casa bien ubicada, muy amplia y acogedora, limpia y las habitaciones con buenas camas. El trato con el personal fue muy cordial. et les gens de son bureau son incroyable. Ils nous ont donné tout la assistance nécessaire. La maison est merveilleuse aussi comment le quartier, proche de les restaurants, de la foire de les dimanches, etc. ; Je reccomande fortement. The apartment was an excellent choice, clean, secure, and spacious, and an ideal location for all activities. There were numerous choices of restaurants, shops, and markets within walking distance. The staff were very helpful, and we would highly recommend staying there, Tommy. This place is a hidden jewell in the great neighborhood San Telmo! After a day in great BA this colonial house is a very relaxing retreat. It exudes a great old feeling from the whole setting to all the small details in the house. THe owner was very professional and helpful. Very responsive to our questions and we could set up check-in en out times that really fitted our schedule. It is an amazingly poetic house on 3 levels with a lot of rooms and possibilities the bathroom has a big window which gives on a small swimming pool at night you can smell jasmine flowers next year if possible i will book it for the length of my stay in Buenos Aires !it is an oasis of beauty and tranquiliity in the middle of San Telmo in a very big city! we enjoyed tremendously to stay there!! thanks! Amazing place! When I saw the apartment, I was speechless for a second. Beautiful space, full of fantastic books, original decoration. I especially loved the bathroom with a patio view, a mini cinema Lynch´s style and a huge table in a dining room. The owner is an amazing host. Lady with fantastic and kind energy. Very very worth your visit! The apartment on calle Humberto is in a great location, it is beautiful and convenient. Just a few yards away from the Plaza Dorrego, in a nice section of Calle Peru, close to the Mercado, restaurants, shops, taxis, buses. Excellent location in San telmo, beautiful colonial building worth experiencing. Mercedes very helpful and responsive. Thank you! We traveled to Buenos Aires for a family member's wedding, which was held in San Telmo. My husband and I traveled with our 5 month old baby (abroad for the first time)-- and his sister. As such, we weren't sure whether the accomodations would fit our family/baby needs. This apartment did not only suit our needs, but we loved the central location, getting coffee (to go!) at the corner cafe, finding a fantastic pastry store around the corner, and being a stone's throw away from Plaza Dorrego-- the music, the dancing, the artesanales... we highly recommend this location. We brought our swim suits for the pool but it was a little chilly out so we never ended up using it-- it was pretty to look at nonetheless. Enjoy your trip to Buenos Aires! I stayed there with friends and we had the most wonderful time. It's a charming place. The little movie theatre downstairs was an absolute success. The owner was kind and helpful anytime we needed them, be it to get towels or to save us when we turned the heating off and couldn't get it back on! We intend to go back there next year, and we want our friends to rent the other available places surrounding the pool, so we'll be like one big family in this stylish yet cozy house! Cheers! I had a great time in BA and part of that was because I stayed at this apartment. It's a great location! I loved the neighborhood and could explore something new every day. And living here gave me the chance to feel like I was part of the neighborhood not just a tourist. There are nice local restaurants, grocery stores and plenty of things to do. The owner was also very friendly and helpful. I would definitely return. The place was cool and cozy. Some things were a little odd but in the way old houses can be. There are however only 2 actual bedrooms. The space is large and the courtyard is very pretty. The location in San Telmo is right in the middle of everything. We really enjoyed our stay. Smack in the middle of San Telmo, and quiet. The house is beautiful decorated, the pool a must for those hot summer days, the service friendly and efficient. But the main plus is the tenants it's attrackting, mostly artistic pleope. Sure, it's not a cheap place. But it's nice to have an interesting conversation with people all over the world around the pool or the asado. The apartment in Plaza Dorrego was great. It was very clean and spacious and is in the best area of San Telmo. I had lived in a few other barrios before I stayed here for a month, and it definitely had a lot of character. I would recommend it for people visiting Buenos Aires for a week or two. However, be warned that San Telmo is far from a lot of other neighbourhoods. If you want to spend the day in Palermo, Belgrano or Recoleta, it can be a bit of a hike. Also, I was more hesitant to travel on my own at night in San Telmo, but felt very comfortable doing so when I lived in Palermo. The owner was an excellent host - she definitely made our trip more interesting and made us feel at home! The neighbourhood is very central in San Telmo with a lot of good markets, restaurants, cafes and shopping nearby! i stayed in the house in nov for 5 days and it was amazing! great location and the owner was excellent to deal with i would highly recommend it !! Estuvimos 9 días hospedados en Buenos aires y lo pasamos muy bien. El departamento es precioso, muy bien equipado, y la atención es excelente! Además está muy bien ubicado, cerca de buenos cafés, restaurantes y del metro. Es un lindo lugar para descansar y aprovechar sus vacaciones!! We absolutely loved the house and had a wonderful experience there. The location was perfect, we literally walked out the front door and we were less than 20 ft away from Plaza Dorrego. 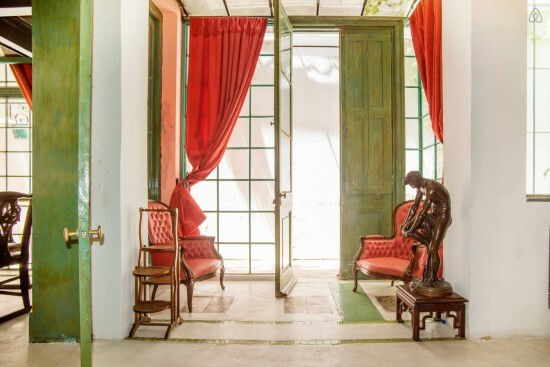 The interior of the home was architecturally fascinating with a surprise around every corner. The open layout was beautiful, although it did not allow for a ton of privacy. The kitchen is great and funky, and the wine cellar was so cool. We would highly recommend this apartment, it was one of the highlights of our trip so far! Thank you!! Great apartment, great location. Easy rental process, plus they arranged transportation from the airport. If I am ever in BA again, be sure to stay here again! We stayed there for a week, me and my family. Not only we loved the apartment, that has so much personality, the owner was lovely and very helpful when we needed. The location is also great, right in the heart of San Telmo, which makes the experience a little more authentic, away from touristy hotels. The house is also very charming and although we didn't have a chance to enjoy the outdoor patio, it was really nice just to enjoy our stay at such a lovely place. The apartment had everything we ever needed and it didn't take us long before we were calling it "home". Really recommend it! We love the atmosphere of this apartment. It has plenty of room and is located in the center of San Telmo. We felt while our stay like staying in a friend‘s home. After reviewing literally hundreds of different apartment options online, my girlfriend and I had the pleasure of staying in this very special unit. It was unforgettable, as was the entire trip, and I am certain that we made the right choice. Thanks for everything...I give this my highest recommendation. We thoroughly enjoyed staying in this apartment. It was private, quiet. Very Stylish. My daughter and I loved the apartment! The only thing that would have made it better would have been warmer weather, so we could have enjoyed the courtyard. Perhaps another time! Thank you for your Argentine hospitality.